Social Media Managers are a special breed. You have to be organized, focused and socially aware. At the same time, you must also be highly skilled in writing, design and communication. It is a role that crosses the boundaries between creative and management. Social Media Managers spend their days engaging with a wide variety of stakeholders and are expected to be world-class multi-taskers. Having the right social media strategy is key to the success of many modern businesses. Customers today expect companies to be very good at engaging through social platforms, responding in a timely fashion and adding value to the core brand. Failure to be responsive can have a massive negative impact on the business. Establishing and documenting your social media strategy will help focus your efforts, understand your objectives and goals, and plan the steps you need to achieve them. This focus and planning will minimize wasted effort and improve your social media marketing productivity. Why are you committing time and resources to social media marketing? What is the purpose of expending this effort? What do you expect to achieve from using social media? How will this help meet the vision of the business? Who do you want to engage with and attract to the business through your marketing efforts? How do you want them to feel about your brand? What actions do you want them to take? Having clear answers to these three questions will clarify the short and long-term goals of your strategy. Once you have a strategy in place, you need to have a plan to meet your goals. If you don’t have a plan, you are likely to waste time moving aimlessly between activities. This makes you reactive to events, rather than proactively leading the development of your business though social media. You will need one or more plans to address each goal and these may require smaller projects to get them done. Each project can also be broken down into smaller tasks that are more easily measured and tracked to completion. Having clear plans can help avoid decision paralysis where actions are not carried out because of a fear of making decisions. When a plan has been agreed and documented, you can just start executing the necessary projects and tasks without further time wasting and discussion. For most businesses a single content marketing plan is sufficient to cover the strategy, goals and plans required for your social media efforts. For a great introduction to creating a content marketing plan, read 17 Tips for Creating a Content Marketing Plan. Content calendars allow you to plan out what you intend to publish on each social media platform and organize the various follow-up social media activities that you will carry out using that content. Content calendars can help with efficient use of time. For example, if blogging is one marketing strategy that you plan to use, you can plan to write several blog posts in a batch and then schedule these posts to be published over several weeks using Sprout’s publishing tools. To improve your social media productivity, you need to focus on the platforms that provide your business with the best return on investment. Start by comparing the performance and costs across all of your social media channels. Then increase the effort and expenditure on the platform that gives the best ROI to make best use of your time and resources. It is essential to also keep up to date with the latest developments in digital marketing. Follow social media marketing industry people on Twitter and develop relationships with people and companies that are driving change. This doesn’t mean scrolling aimlessly through your news feed for hours on end! 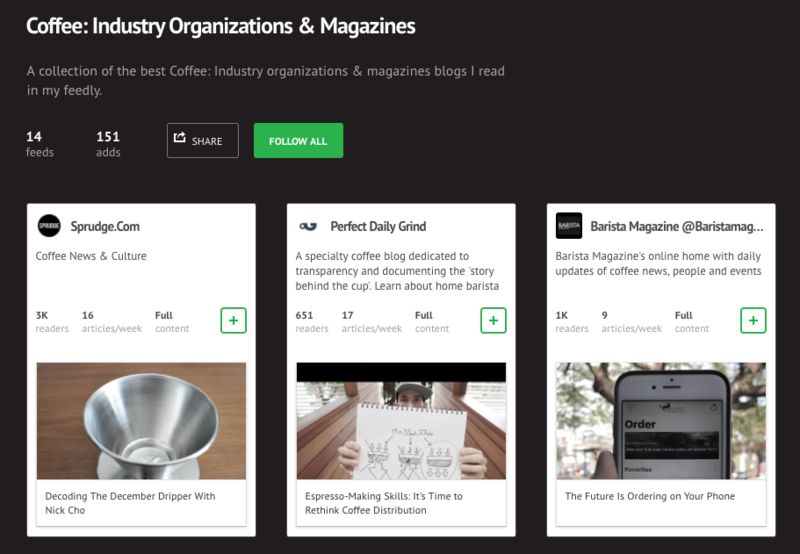 Subscribe to blogs and newsletters that curate news and events relevant to your industry. 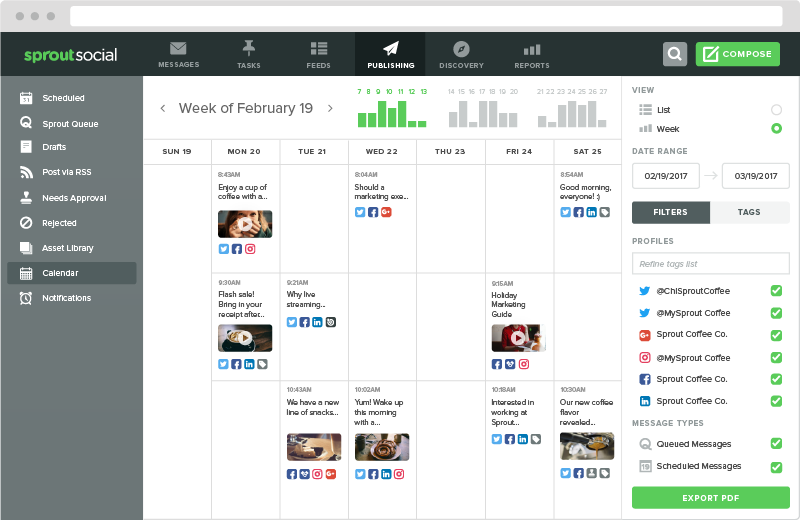 Or use aggregators like Feedly to get all your news in one place. Look out particularly for breaking global news that might be relevant to your brand. Use tools like OneNote or Evernote to take notes of interesting stories you find and feed these into your content planning. Writing good content is all about being efficient and organizing your work. Using a project management tool such as Trello is a great way to collect content ideas and improve social media productivity. Once you have your ideas documented, you can add notes, assign them to different members of your team, attach due dates, facilitate collaboration with other team members, track progress and move them from an initial idea right through to publication. A process is a set of defined tasks needed to complete a given business activity. Well defined processes can help you improve the quality and efficiency of your work. They allow you to avoid “reinventing the wheel” every time an activity needs to be completed and are ideal for documenting the many repetitive activities a social media team needs to complete. This can be a great time-saver, particularly where you need to involve others who may not be so familiar with the activity. Processes can be used to document tasks involved in publishing blog posts, creating tweets and Facebook posts, preparing images for different platforms and many more. Documenting processes doesn’t always have to mean creating a huge Microsoft Word document. Checklists, in particular, can be a great time saver helping you understand your daily, weekly and longer term priorities and ensuring that you carry out those tasks first. If you need help getting started, here’s a great checklist to get some ideas. Check out the full list here. Once you have mastered developing processes, procedures and checklists, consider taking things to the next level by automating tasks where possible. Outsourcing social media tasks can reduce the amount of time you spend on routine activities. Bigger organizations might have whole teams based in other locations to carry out this work or use specialist outside agencies. But even small businesses can take advantage of outsourcing through the use of virtual assistants and freelancers. Outsourcing can help you improve your social media productivity. The specialist agencies and individuals that offer social media services have lots of knowledge and experience and are used to following processes that make recurring tasks quicker to perform. They can help you with all kinds of activities including social media monitoring, customer service, marketing and administration. Outsourcing routine work means you can focus on the more important aspects of social media management such as brand image and responsiveness to customers. If your customers expect your social media presence to be active 24 hours per day, then outsourcing can allow you to “follow the sun” by having social media activities carried out by staff in other time zones while you continue to work normal office hours. How much time do you spend collecting data and putting together reports? More than likely, it’s too much. Thanks to all of the tools available today, creating reports doesn’t have to require a lot of manual work. 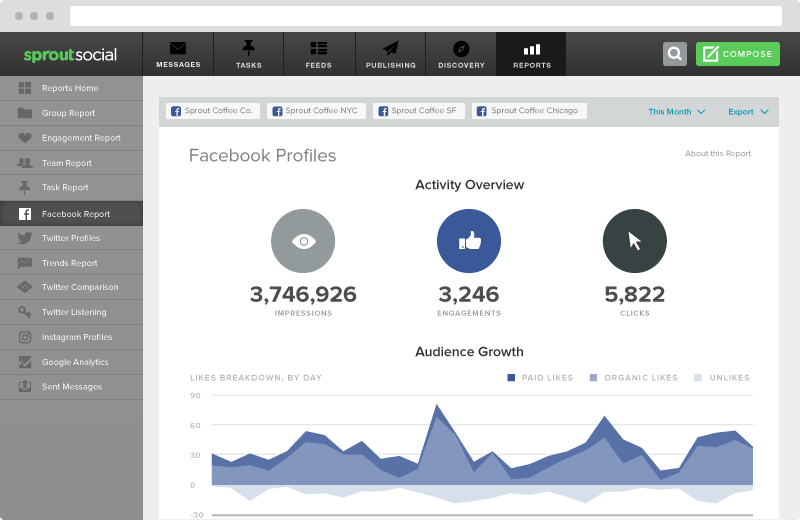 You can use Sprout’s suite of analytics tools to automatically generate reports on your social engagement, audience growth and more. Ideally you should be spending more time analyzing data than pulling it together. You will need a range of tools to cover the various things you need to get done as a social media manager. If you have tools that integrate with one another, you can save a lot of time and effort. Even better, you can select tools that cover multiple functions to reduce the number you need. 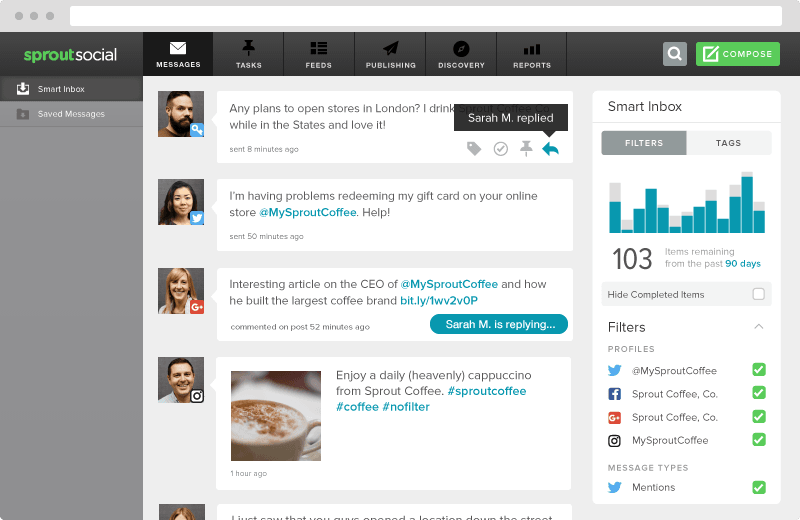 Tools such as Sprout Social can increase your efficiency by allowing you to manage your profiles on several of the social networks you use from one place. Social media management tools like Sprout Social improve productivity by allowing you to monitor and manage all of your profiles at once and eliminate the need to log into each separately. As a social media manager, you have many demands on your time. You are not going to get a lot done if you spend too much time trying to make sure everything you publish is 100% perfect. The great thing about social media is it moves quickly. You always have another shot at a Tweet or Instagram post, so there’s no need to fixate on every little detail. While you do need to put genuine effort into your social media activity, there comes a point where you’re getting diminishing returns. Spending an extra 20-30 minutes to craft an Instagram caption probably isn’t worth the additional Like you may get from it. Make sure you’re spending your time wisely. 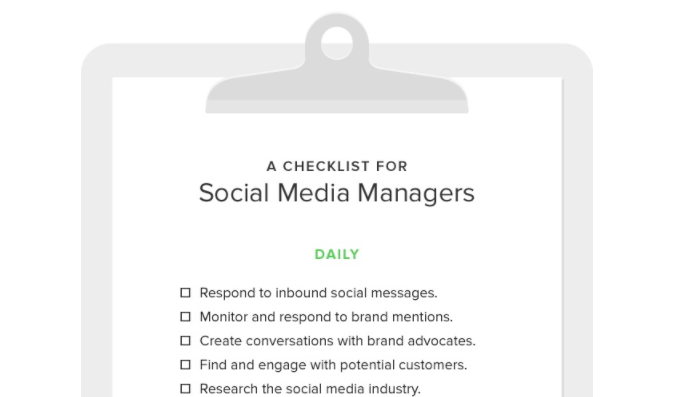 What are some of your favorite tips for being a productive social media manager? Leave a comment below! Richard Dally: With a background as an Information Technology Service Management Consultant, Richard brings lessons learnt from his time working with large organizations to the challenges faced by solopreneurs and small businesses, teaching them continual improvement skills and coaching them on better use of digital engagement and online marketing strategies. He helps his clients provide more value to their customers by giving them the ability to plan, design and deliver more efficient and effective products and services. more about Richard by visiting his website.